Exceptional detail makes these floating alligator heads a valuable deterrent for unwanted pond visitations. Frighten pond predators and unsuspecting friends with this realistic reptilian replica. 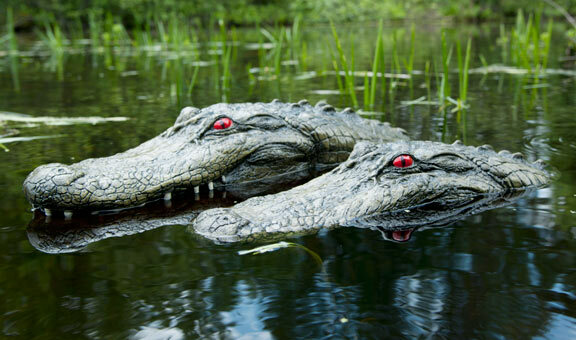 Both Gator Pond Decoys are sure to make heads turn whether wildlife or human. Exceptional detail & hand painting makes these floating alligator heads a valuable deterrent for unwanted pond visitations. Gator decoys floats freely across koi ponds and water gardens, demonstrating life-like motion with wind or water movement. Reflective red eyes add to realism. Great for any water area infested with geese, egrets, cormorants, herons and other unwanted wildlife. (we have had limited success with mallards & wood ducks. Northern ducks seem to want to be friends with the decoys). The Alligator are made from durable urethane foam. Protect prized koi and other pond fish with your very own "guard gators." Add a little fun to your pond, while protecting your valuable fish. Both the 22" & the 28" floating alligators float freely and life-like in the pond or pool. Birds think that they're being followed by a predator so they leave for a safer area. EACH ALLIGATOR IS HAND PAINTED WITH UV RESISTANT PAINT TO LAST MANY YEARS! No two alike! Both Gator decoys floats freely across koi ponds and water gardens, demonstrating life-like motion with wind or water movement. Can also be used as a kickboards in swimming pools! From Krystal Boulton of Boca Raton, Florida on 7/24/2018 . From Jan of Raleigh, North Carolina on 6/5/2018 . From Anonymous of Barrington, Illinois on 7/17/2013 . From Anonymous of Olmsted Falls, Ohio on 3/29/2013 . From Anonymous of vancleave, Mississippi on 8/15/2012 .